(4) The great rishi said: 'This day of Brahmâ [kalpa] six Manus have passed: Svâyambhuva and five others. I already described the period of the first one [Svâyambhuva] including the divine personalities who appeared during that time [see 2.7: 43-45, 3.12: 54, 4.1 and 4.8: 6]. (5) From Âkûti and Devahûti, two daughters of [Svâyambhuva] Manu, sons were born [Yajña and Kapila] known as [incarnations of] the Supreme Lord for [respectively] instructing dharma and jñâna [spiritual knowledge]. (6) Kapila I have fully described to you [see Canto 3b], let me now tell you everything that Yajña[mûrti or Yajñapati] did, oh best of the Kurus. (7) The master of the world [Svâyambhuva Manu], the husband of S'atarûpâ, detached from enjoying his senses, after renouncing his kingdom, went together with his wife into the forest for doing his tapas [see 3.22: 31]. (8) At the river Sunandâ he performed for a hundred years the severest austerities, in which he on one leg touching the earth [see also 4.8: 78-79] murmured the following, oh scion of Bhârata. (17) S'rî S'uka said: 'When the Asuras saw how he [Svâyambhuva Manu] concentrated his mind with the philosophical mantras, the evil spirits chased him in order to devour him. (18) But Yajña [Vishnu], the Supreme Personality, the Lord in the heart of everyone, saw what the Asuras had in mind and killed them. Thereafter He ruled the heavenly worlds surrounded by the gods [named] the Yâmas [the ones sworn, His sons]. (19) Svârocisha, the son of Agni became the second Manu. From his loins the sons headed by Dyumat, Sushena and Rocishmat were born. (20) In that period [of Manu] Rocana [the son of Yajña] became the king of heaven [the Indra], Tushita and others faithful to the Absolute Truth were the gods, while Ûrja, Stambha and others were the seven sages. (21) From the saint Vedas'irâ, impregnating his wife Tushitâ, the Lord was born who is known as Vibhu. (22) From Him remaining a celibate brahmacârî, eighty-eight thousand saintly persons fixed in that vow took initiation and instruction. (23) The third Manu was named Uttama, he was a son of Priyavrata [see 5.1] and from him the sons called Pavana, S'rîñjaya, Yajñahotra and others were born. (24) The seven sages [during his reign] were the sons of Vasishthha headed by Pramada. The Satyas, Vedas'rutas and Bhadras were the gods and Satyajit was the Indra. (25) [In this manvantara] the Supreme Lord, the Personality of Godhead celebrated as Satyasena, was born from the womb of Sûnritâ and the demigod Dharma. He appeared together with the Satyavratas. (26) He together with his friend Satyajit [as the Indra] killed all the Yakshas and Râkshasas, the sworn liars and evil spirits, who with their misconduct constantly harassed the living beings. (31) The honorable king [Parîkchit] said: 'Oh son of Vyâsa, we would like to hear from you how the king of the elephants who was harassed by a crocodile, was delivered by the Lord. (32) Whenever and wherever there are the narrations in which Hari, the Supreme Personality, Uttamas'loka [the Lord Praised in the Verses] is glorified, great piety, fortune, auspiciousness and virtue are found.' "
(33) S'rî Sûta said: "By the words of Parîkchit, who awaited his impending death, thus being encouraged to speak, dear brahmins, the son of Vyâsa, after complimenting him, spoke with great pleasure to the sages who had assembled there to listen to him." Third revised edition, loaded April 15, 2019. The honorable king [Parîkchit] said: 'Oh guru, thus far I extensively heard about the dynasty of Svâyambhuva Manu wherein the great rulers of the universe have contributed to the creation. Can you please also describe the other Manus to us [see also 3.11: 23-28]? Oh brahmin, the scholars speak about the appearances and activities of the Supreme Glorified Lord during the manvantaras [the periods of the Manus *, see also 2.1: 36, 2.3: 9, 2.7: 2, 2.10: 4]. Can you please also describe these to us, your eager listeners? The great rishi said: 'This day of Brahmâ [kalpa] six Manus have passed: Svâyambhuva and five others. I already described the period of the first one [Svâyambhuva] including the divine personalities who appeared during that time [see 2.7: 43-45, 3.12: 54, 4.1 and 4.8: 6]. 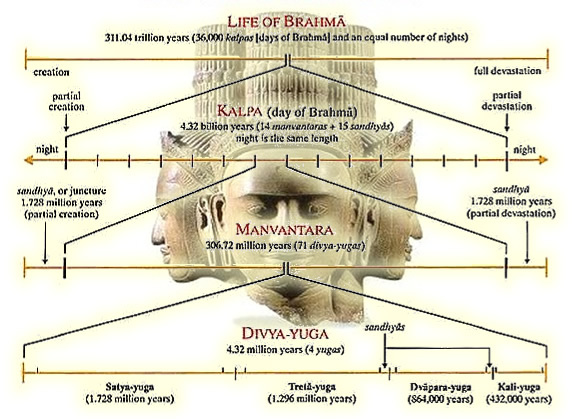 From Âkûti and Devahûti, two daughters of [Svâyambhuva] Manu, sons were born [Yajña and Kapila] known as [incarnations of] the Supreme Lord for [respectively] instructing dharma and jñâna [spiritual knowledge]. Kapila I have fully described to you [see Canto 3b], let me now tell you everything that Yajña[mûrti or Yajñapati] did, oh best of the Kurus. The master of the world [Svâyambhuva Manu], the husband of S'atarûpâ, detached from enjoying his senses, after renouncing his kingdom, went together with his wife into the forest for doing his tapas [see 3.22: 31]. At the river Sunandâ he performed for a hundred years the severest austerities, in which he on one leg touching the earth [see also 4.8: 78-79] murmured the following, oh scion of Bhârata. Lord Manu said: 'He by whom this entire universe is set in motion, is not moved by the universe himself. He who is always awake while one is asleep in this body, He, the One knowing, is not known by the living entity itself [see also B.G. 18: 55]. One may enjoy that what is allotted by Him, the Supersoul who is present everywhere with everything and everyone in the universe, but one should not covet the wealth of others. He whose eye sees all and who is not seen by the living entity, He, the original source of all beings who knows no diminution, is the godhead and companion [see 6.4: 24] everyone should worship. There is no beginning, no end, nor a middle to Him, no one is his friend or foe. He is not [just] the inside nor [just] the outside of the cosmic creation. All these [aspects] of Him and the universe originating from Him, together constitute the Complete Reality [Om pûrnam, see also the S'rî Îs'opanishad and 2.1: 24]. That assemblage of the universe known by many names [like purusha and virâth rûpa] is the Supreme Master, the Ultimate Truth of His person, the unborn self-effulgent one who is the oldest. By means of His external energy He gives rise to birth, death and maintenance, while He remains aloof, inactive and untouched by dint of His spiritual potency [compare 1.7: 23]. For the purpose of being freed from karma [fruitive labor] all sages therefore, to begin with, request [people] to engage in [nonprofit, charitable, voluntary] activities [in karma-yoga]. A person thus engaged almost always will become indifferent [about performing work with an ulterior motive, see also 1.5: 12, 1.2: 13 and B.G. 3: 9, 6: 3, 3: 6]. Because He in His completeness is fully satisfied from within, the Supreme Lord, the Master [of yoga], never gets entangled in the matters He is engaged in, and that is why people who follow Him never get discouraged. S'rî S'uka said: 'When the Asuras saw how he [Svâyambhuva Manu] concentrated his mind with the philosophical mantras, the evil spirits chased him in order to devour him. But Yajña [Vishnu], the Supreme Personality, the Lord in the heart of everyone, saw what the Asuras had in mind and killed them. Thereafter He ruled the heavenly worlds surrounded by the gods [named] the Yâmas [the ones sworn, His sons]. Svârocisha, the son of Agni became the second Manu. From his loins the sons headed by Dyumat, Sushena and Rocishmat were born. In that period [of Manu] Rocana [the son of Yajña] became the king of heaven [the Indra], Tushita and others faithful to the Absolute Truth were the gods, while Ûrja, Stambha and others were the seven sages. From the saint Vedas'irâ, impregnating his wife Tushitâ, the Lord was born who is known as Vibhu. From Him remaining a celibate brahmacârî, eighty-eight thousand saintly persons fixed in that vow took initiation and instruction. The third Manu was named Uttama, he was a son of Priyavrata [see 5.1] and from him the sons called Pavana, S'rîñjaya, Yajñahotra and others were born. The seven sages [during his reign] were the sons of Vasishthha headed by Pramada. The Satyas, Vedas'rutas and Bhadras were the gods and Satyajit was the Indra. [In this manvantara] the Supreme Lord, the Personality of Godhead celebrated as Satyasena, was born from the womb of Sûnritâ and the demigod Dharma. He appeared together with the Satyavratas. He together with his friend Satyajit [as the Indra] killed all the Yakshas and Râkshasas, the sworn liars and evil spirits, who with their misconduct constantly harassed the living beings. The fourth Manu was the brother of Uttama known by the name of Tâmasa. He fathered ten sons headed by Prithu, Khyâti, Nara and Ketu. The Satyakas, the Haris and the Vîras were the gods, Tris'ikha was the king of heaven and the seven sages during the reign of Tâmasa were headed by Jyotirdhâma. The [other] gods were called the Vaidhritis. They were the sons of Vidhriti, oh King, who by their own strength managed to protect the Vedas that over time had been lost. In that period the Supreme Lord appeared who was begotten by Harimedhâ in the womb of Harinî. He was called Hari. Gajendra, the king of the elephants, was freed by Him from the mouth of a crocodile [for a description of the fifth and sixth Manu see chapter 7.5]. The honorable king [Parîkchit] said: 'Oh son of Vyâsa, we would like to hear from you how the king of the elephants who was harassed by a crocodile, was delivered by the Lord. Whenever and wherever there are the narrations in which Hari, the Supreme Personality, Uttamas'loka [the Lord Praised in the Verses] is glorified, great piety, fortune, auspiciousness and virtue are found.' "
S'rî Sûta said: "By the words of Parîkchit, who awaited his impending death, thus being encouraged to speak, dear brabmins, the son of Vyâsa, after complimenting him, spoke with great pleasure to the sages who had assembled there to listen to him." *: There are fourteen Manus during a day of Brahmâ, and the age of each Manu lasts for seventy-one yugas (see picture). Thus there are thousands of Manus during the life of Brahmâ. The six mentioned here are: Svâyambhuva, Svârocisha, Uttama, Tâmasa, Raivata and Câkshusha. A manvantara is a period to the measure of one cycle of the sun around the centre of our galaxy [see the Galactic Order]. **: Often quoted in this context is the dictum: 'nityo nityânâm cetanas cetanânâm'. Both the Lord and the living entities are eternal and sentient. province of Siemreap, Phnom Bok, Bakheng style, end 9th century/ beginning 10th century. Musée Guimet, Paris. Source.